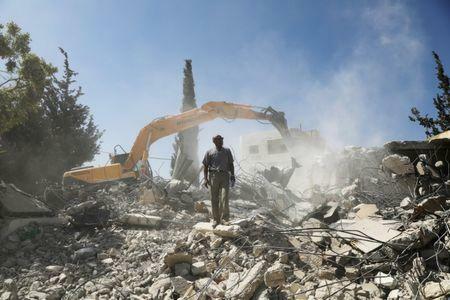 JERUSALEM (Reuters) - Two Palestinian families on Thursday demolished the homes they had lived in for nearly two decades, saying they would rather destroy them than face the prospect of Israeli settlers moving in. Within two hours, two mechanical diggers smashed through the ceilings, walls and floors of the two buildings in Beit Hanina, a village on the outskirts of East Jerusalem, territory that Israel captured in the 1967 Middle East war and then annexed in a move not recognized internationally. Jihad Shawamreh, 50, a taxi driver, said that he built his six-room house in 2000 and that his ex-wife Fawzia, their six children and other relatives lived there until Thursday. The demolition was the culmination of a lengthy legal battle. Israel's Supreme Court ruled in January that the land on which the homes were constructed had been under Jewish ownership since 1974 and that documents presented by the Palestinian families to support their claims had been forged. and believed they were the rightful owners. "I built (my house) with my own hands. It is where I brought up my children. This is where they grew up," Shawamreh said, as the Hyundai digger went to work. "We took down the houses for fear of seeing settlers move in, and having to see them inside the house." The Israel Land Fund, whose stated goal is "acquiring all the Land of Israel for the Jewish people", advertised on its website after the court decision six months ago for "4 idealistic families" willing to move into the homes. The group's director Arieh King told Reuters there were no immediate plans for new construction. He said the land had been sold by its original Israeli owners to other Israeli buyers, but did not identify them. Most countries consider settlement activity, on territory Israel occupied in 1967, as illegal. Israel disputes this. Settlement in Jerusalem is a particularly sensitive issue. Palestinians want East Jerusalem as capital of a future state, while Israel regards all of Jerusalem as its capital, a claim that has not won international recognition. Shawamreh said the demolition cost 30,000 shekels ($8,200) and that he had turned down offers of money from Israeli settlers to leave the buildings standing. Friends, neighbors and the newly homeless families watched glumly on a hillside in Beit Hanina as dust rose into the air. Shawamreh's neighbor Zeinat Abu Rumeileh, 62, cried as she sat beside the other demolished home, in a tent that she said had been provided by the Palestinian Authority, which exercises limited self-rule in the occupied West Bank. "I am not able to watch," she said, weeping into a handkerchief. "I was afraid, of course, but we didn't think that this would happen, or even come close to happening."